Hyderabad’s International Kite Festival found its way to a larger venue this year – away from the hustle and bustle of Necklace Road – the Aga Khan Academy near the airport. Makara Sankranti is an important Indian Harvest Festival celebrated across the country. This day marks the return of the sun after the cold winter and is a harbinger of the coming harvest season for farmers. Also known as Pongal in some states of the South, it gets its name from the dish that is made this day. Rice from the first harvest of the year is cooked in milk that has come to a ‘pongu’, meaning boil and sweetened with jaggery or sugar. 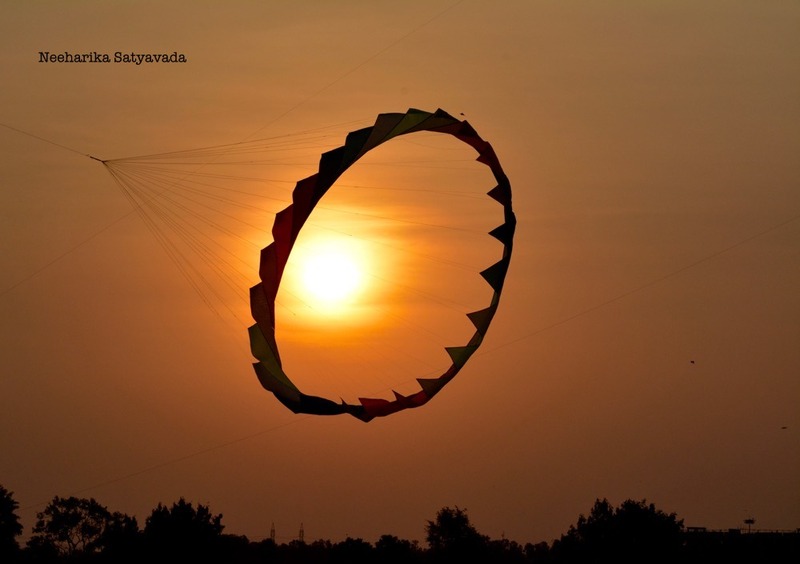 In Gujarat, where the biggest Kite Festival of the country takes place, it is Uttarayan. How ever many be the names that this festival is called by, the one common thread that weaves through it is the ‘flying of kites’. India is of many religions and this is one of the celebrations that brings together, them all. For, it is believed that the custom of flying kites was brought to India by the Persian muslims! Yes it does not make up for the nostalgia of that simple childhood joy. Of stringing up your kite with manja (thread coated with the tiniest shards of glass), running around with your spool on the terrace as you try to ‘cut’ as many kites as you can and then counting your loot at the end of it all. But, this 2 day Kite Festival does bring to you an array of different kinds of kites from across the globe. It is usually right after the sun rises and before the sun sets that one flies kites while it is still pleasant and the sun isn’t too sharp, but it is still breezy enough for the kites to take to the sky. & with the setting sun, out goes the light and the International Kite Festival 2016 of Hyderabad draws to a close. Loved the third pic!! Looks like the sun had a crown!! Thank you 😊 Right time, right place!! What colourful kites and ingenious designs….love the first big one and the way u have photographed it!! Looks like u have a grab of the sun in a fishing net!! Surreal!!! Thanks so much.😄 Its become a habit to await your take on the post and its always worth it! !